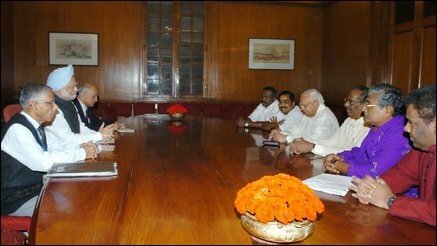 The TNA MPs meeting with Indian Prime Minister, described as a turning point, comes following their meeting with the Chief Minister of Tamil Nadu, M. Karunanidhi, Wednesday. India had a special concern for the Tamil people, the Indian PM told the TNA delegation. India had reieterated to Sri Lanka that it should not seek a military solution, but be fully prepared to meet the aspirations of the Tamil people while preserving the island's sovereignty, the Prime Minister told the TNA delegation. Tamil Nadu Chief Minister M. Karunanidthi had sent his Special Representative, Mr. Subaveera Pandiyan, who also took part in the meeting. TNA parlimentarians with Indian Prime Minister Dr. Manmohan Singh. The TNA delegation, comprising the leaders of the alliance parties, brought to the attention of the Indian Prime Minister that Sri Lanka has nullified the merger of NorthEast, a corner stone for any negotiated solution in Sri Lanka. Indian Foreign Secretary Shiv Shankar Menon and Prime Minister's National Security Advisor MK Narayanan accompanied the Prime Minister in the meeting with the TNA parliamentarians. The meeting lasted for 45 minutes at the Prime Minister's Office located at Raisina Hill, New Delhi from 11:15 a.m. til noon. Meanwhile, Kalaignar M. Karunanidhi, Chief Minister of Tamil Nadu state, with more than 60 miliion Tamils, Thursday vowed to to do everything possible to end the sufferings of Tamils in Sri Lanka. "Helping Sri Lankan Tamils is in our blood. I am not a person who expects anything in return for the things I am doing. I will continue to do my duty of helping you," Rediff News quoted Tamil Nadu Chief Minister as telling a group of refugee students who met the Chief Minister to thank him for allowing them to write the 'O' level examination of Sri Lankan Education Board from TamilNadu.